Colin Firth is on top of the world right now. He’s got a Golden Globe nomination for his work in The King’s Speech as King George IV, he’s rumored to be on the inside track to landing an Oscar nod, and, oh yeah, he just got his star on the Hollywood Walk of Fame. 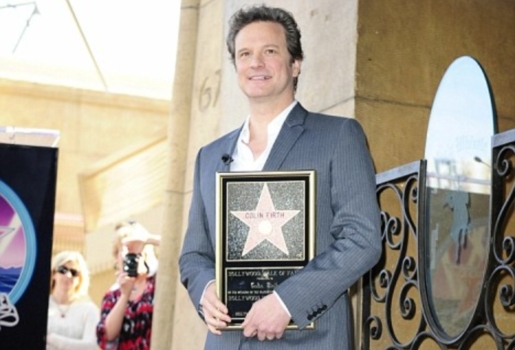 Colin Firth’s name is going to be immortalized in a star on Hollywood Boulevard in what is Hollywood’s greatest honor. Appropriately, Colin Firth’s star is located next to fellow English actress and Oscar beloved Emma Thompson (and his name is spelled correctly, unlike Julia Louis Dreyfus’s star). Both stars are located outside of the Pig ‘N Whistle, an English-style pub on Hollywood Boulevard. It’s this English connection that amuses Firth most.